Do you desire to behold Jesus, the Lamb of God, and be filled with more adoration for Him than you’ve ever experienced before? Me too. There’s nothing better than beholding Jesus. I was studying Isaiah 53–the chapter about the suffering of Christ–recently, and I was just staring at our Savior. And while I stared at His beauty through His Word, the Holy Spirit downloaded to me 10 things Jesus purchased for you and me with His suffering. 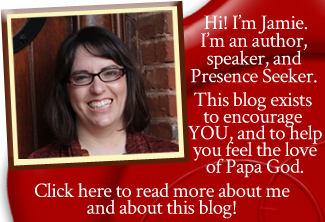 It was a powerful encounter–one that I want to share with you. So, to help you behold Jesus with me through the lines of Isaiah 53, I recorded a powerful audio teaching about these 10 things Jesus purchased for you with His suffering. This teaching is about beholding Jesus. Jesus who saves, delivers, and heals in every way. The Holy Spirit wrecked me while I was studying this message. He wrecked me while I was recording it. And He wrecked me again while I was editing it. It’s the Word of God, and it’s going to bless you. It contains foundational principles that you need in order to walk in the complete victory Jesus purchased for you. So are you ready to behold the Lamb of God? Are you ready to encounter His glory and majesty as revealed in the pages of Scripture? 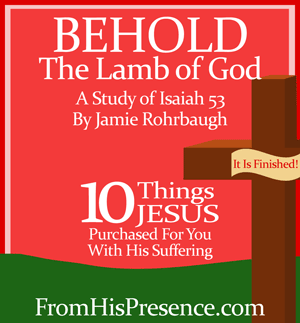 Click here to purchase and download “Behold The Lamb Of God” on my online store! It’s $4 for 63 minutes of teaching, and it’s going to bless your socks off.